Exploding Kittens: The ultra successful but simple kickstarter card game, is a game that I received as a present and have only played a handful of times. This week I was with a card game and animal lover, so felt it suited their profile. It's a fairly straight forward and easy to teach game, its fun in small sessions and has some funny art if people want to pay attention to what the cards are actually saying. As with a lot of card games, this is totally luck based and there isn't really a whole lot of skill - but if you like card games you can still have a pretty good time here. Sheriff Of Nottingham: I can't quite figure out the right group for this game. Sometimes it's a hit, and other times people don't seem that engaged bringing a gross lack of bargaining, smuggling contraband and as a result the game really suffers. I know there's fun to be had with Sheriff, but it really seems dependant on how players are playing. This week's play through fell a bit flat, with virtually no deals made at all with the Sheriff, but thankfully there was a lot of contraband being passed about. I don't mind Sheriff, but after a few average sessions I'm never that excited to pull it out. Power Grid: Finally! I can't recall exactly when I purchased Power Grid, but for various reasons I haven't been able to get a game organised. Well being in the weekly cap, obviously that changed this week. 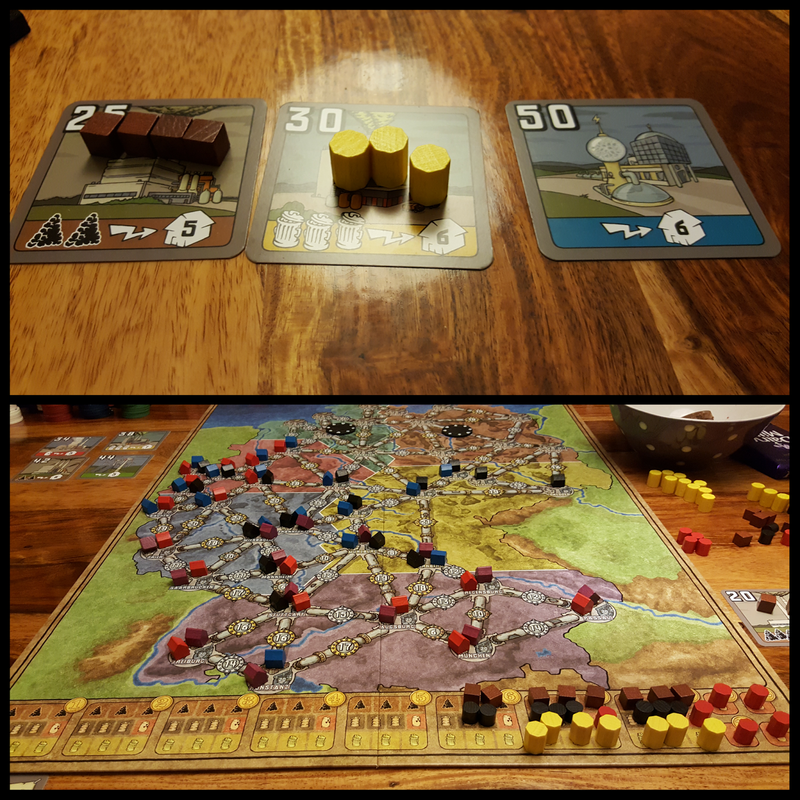 Learning and teaching Power Grid was no where near as bad as I thought it was going to be. It's actually fairly straightforward and easy to grasp with the only difficulty being the amount of upkeep and things to keep track of that are in the game. Money and resources are so crucial in Power Grid, so when I upgraded a power station fully loaded with Oil that I had no where to store - it virtually signed my defeat. In the end two players had 17 cities, I had 16 and last followed with 14. Even though the score seemed close and I felt I was in it the whole time - the two lead players alternated between first and second for the last half of the game and rightfully deserved to win. Some quick words on Power Grid - clever, intricate, well-designed, thinky, euro, dry. What a great game, but be warned the fun lies in the well structured the markets and the constant balance between leading and keeping behind. After finally getting a first play in, it was well worth the wait but definitely is a game I won't get to play as much as I'd like as you need the right group. Oh and it took us 2.5 hours for a four player game where everyone was learning. Lost Cities (The Card Game) : Anyone who reads this blog will know I love a good two player game, and it was with good pleasure that I was finally able to add Lost Cities to the library. I have had this on the list to buy for a fair while, but stock always was pretty limited in Australia (let alone Tasmania) that I couldn't resist a 20% off boxing day sale. Simple, fast, depth in it's strategy and easy to teach, give Lost Cities some good qualities to make it a perfect choice to pull out when you only have one other person to play a game with. Glad I finally have this. Escape - Quest Expansion: The base game of Escape is a fun unique game of dice rolling that has always been great to start off a night when introducing a new group to board games. It gets the imagination going as soon as the sound track starts and the frantic dice rolling begins and by the end of it everyone is laughing and ready for more. Couldn't really ask for a better start to the games night, but lately I've found the base game too easy to win. Spread out in groups of two, uncover as many tiles as possible, find the exit, head back to the middle in time for the first gong, then as a group ditch as many gems as possible and finally flee to the exit. It works just about every time and we've even been out with a minute or two to spare. Winning is nice, but easy winning takes away from the frantic exciting pace and this is where I'm hoping Quests will be able to step in. I haven't tried it yet - but am hoping it's easy enough to play with anyone, but mixes things up to keep us on our toes for the 10 minute adventure. Looking forward to adding this expansion in! Blood Rage - 5th Player Expansion: As mentioned above - our main gaming group consists of 5 players. I love Blood Rage, but it's only 4 players. This one wasn't a difficult choice, even if its expensive, doesn't fit in the box and could have easily been included in the original game - I'm still pretty happy to have this in the library ready to go next time the five of us meet up for a game. Now to decide if I stick with my usual Bear clan or try the new Ram clan? And that's it for another week.. I am still expecting a couple more back ordered games in the mail so hopefully they'll show up in the next week or two!